A group of World War II pilots — known as the Tuskegee Airmen — were the first African American pilots in the military. They battled in the skies over Europe, and against racial barriers back home. One of the last surviving Tuskegee Airmen, who served in three wars, died Thursday in New York. 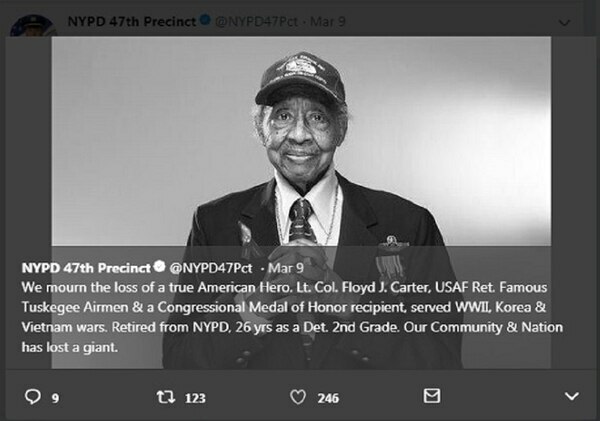 Retired Lt. Col. Floyd Carter Sr., 95, originally of Yorktown, Virginia, was dedicated to serving his country as well as his city and excelled as both a pilot and as a New York Police Department detective, according to the New York Daily News. Carter joined the Army Air Corps in 1944 and became a Tuskegee Airman — the first all-black unit of what was to become the U.S. Air Force — and served as a second lieutenant bombardier navigator in World War II. The Tuskegee Airmen were the first African American service members to successfully complete pilot training and enter the Army Air Corps (Army Air Forces), according to the National Park Service. Almost 1,000 aviators were produced as America’s first black military pilots. In addition, more than 10,000 military and civilian black men and women served in a variety of support roles. “Acceptance from Army Air Forces units came slowly, but their courageous and, in many cases, heroic performance earned them increased combat opportunities and respect,” according to the Park Service. Carter joined the Air Force Reserve in 1947. The following year, he led the first squadron of supply-laden planes into Berlin during the famed Cold War airlift of 1948-49. He went on to serve in both the Korean and Vietnam wars. During North Vietnam’s Tet Offensive in 1968, Carter flew U.S. troops and supplies into South Vietnam. The Twitter page of the New York Police Department's 47th Precinct on March 9 mourned the passing of one of it's own. Carter earned the Congressional Gold Medal (rather than the Medal of Honor) for his World War II service with the famed Tuskegee Airmen. Before retiring from the Air Force Reserve in 1974, he served as the commander of the 732nd Military Airlift Squadron at McGuire Air Force Base in New Jersey. Carter joined the NYPD in 1953 and earned his detective’s gold shield after three years. Before retiring in 1980, he worked as a bodyguard for visiting heads of state. President George W. Bush presented the Tuskegee Airmen with Congressional Gold Medals in 2007 for their service and for breaking the color barrier in the pilot ranks. They were invited to attend President Barack Obama‘s inauguration in 2009. Carter is survived by his wife, Atherine, and their two children, Floyd Jr. and Rozalind, along with grandchildren and great-grandchildren, according to the Daily News.